I must admit I'm a bit biased regarding Alison's apartment, because, as the name suggests, it belongs to my partner, Alison. However, she's decided to "sponsor" my site, mainly because I've agreed to let her do it for free. Come on, I couldn't charge her, could I? I fully endorse Alison's apartment, not just because Alison is my other half, but because I've stayed there many times. It's situated in Victoria Court 2, a nice, quiet complex in Los Cristianos. The complex itself has a nice, large heated pool, with a separate small pool for children. Sunbeds are available for hire. There is a bar/restaurant, open daily, 9am till midnight, serving snacks, full meals and drinks. The office on the complex offers Internet access, a wifi connection for 15 euros a week, a laundry service and they'll do things for you such as order taxis. There's also a maintenance man on hand in case anything in the apartment needs fixing. The apartment itself is one bedroom, containing twin beds and is situated almost on the ground floor, with a small flight of steps to reach the front door. For guests staying more than one week, there is a complimentary laundry service. 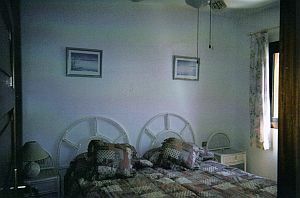 The bedroom features twin beds, with a ceiling fan and a safe. There is ample wardrobe space. The kitchen is fully fitted, with electric cooker, microwave and fridge. There is also a separate freezer. 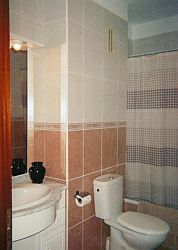 There is a fully equipped, luxury bathroom, with bath and shower. The lounge features a TV with English channels (BBC 1&2, ITV, ITV2+1, Channel 4, Channel Five, plus various sport and news channels). There is also a DVD player and a radio/cassette player. The whole apartment has been recently refurbished to a high standard. The complex Victoria Court 2 is at the bottom end of Los Cristianos, not far from the Arona Gran Hotel. It is convenient for the beach, restaurants, bars, supermarkets and nightlife entertainment. The bus station is within easy walking distance, as is a taxi rank and the town centre. 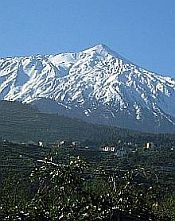 Alison is offering this apartment for holiday lets at a very competitive rate. The office on the complex also offers her apartment for rent for slightly higher rates, so it would be worth your while to contact her directly. Just fill in this form to submit an enquiry and Alison will get back to you with availability and prices.